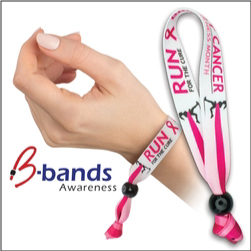 Order Custom Printed Adjustable Support Bands – perfect for displaying your support awareness at races, competitions, parades, or just everyday. Great for Clubs, Organizations, Groups, Schools, Causes, and so much more. Adjustable bead, great for one time or multi-day use. Durable, Comfortable, and Lightweight. Order your Awareness B-Bands today!